Did you leave room for pumpkin pie? If you’ve stuffed yourself at the holiday feast and you don’t feel like you’ve room for one more bite, perhaps you’ll have enough room for a sip or two of pumpkin pie rooibos! The fragrance of this tisane is strong – very pumpkin-y! As my tea cup sits in front of me, the scent of fresh pumpkin pie perfumes the air and brings a smile to my face! The flavor is also very pumpkin-y. 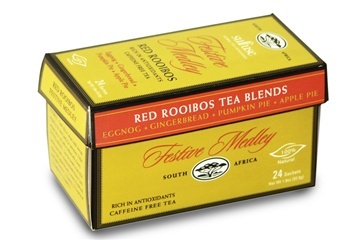 I don’t know that I’m tasting a lot of “pie” or pastry flavor, perhaps a hint of buttery taste and the natural nutty flavor of the rooibos also lends a bit of the pastry taste to the cup. But, what it lacks in “pie” it definitely makes up for in pumpkin. And let’s face it, when we eat pumpkin pie, we want the pumpkin, am I right? I remember when I was young, I used to eat the pumpkin and leave the pie crust on my plate. The pumpkin has a pleasant squash taste that’s been seasoned with cinnamon. It is not an overly seasoned pumpkin, but it has just enough spice in there to make it interesting without detracting from the taste of the pumpkin. What I really like about this particular tisane is that the pumpkin is so prominent and it is a true pumpkin flavor. So often with pumpkin flavored teas, I taste the tea, but, I don’t get a very authentic pumpkin flavor. You won’t hear that complaint from me with this tisane; it’s delicious!